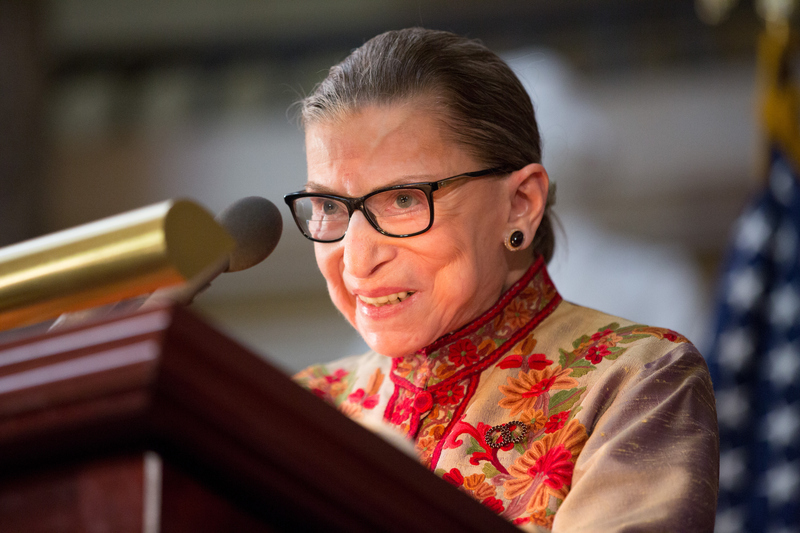 If we can learn anything from the things we read on the internet, we can get quite the education from Ruth Bader Ginsburg's Supreme Court opinions. Following the release of her concurring opinion in the June 27 Whole Woman’s Health v. Hellerstedt decision, searches for the phrase "faute de mieux" have reportedly increased 495,000 percent at Merriam-Webster.com as curious Notorious RBG fans sought to fully understand Ginsburg's diction. So what does "faute de mieux" mean, and where can we find this French parlance in the context of Ginsburg's opinion? Ginsburg wrote, "When a state severely limits access to safe and legal procedures, women in desperate circumstances may resort to unlicensed rogue practitioners, faute de mieux, at great risk to their health and safety." Pardon her French, y'all, but she makes a great point. The phrase faute de mieux, loosely translated, means for lack of a better alternative. According to CNN, the correct pronunciation of the phrase is Foht-duh-MYUH. Ginsburg is saying that when a state limits women's access to safe reproductive healthcare, women will seek out dangerous, occasionally life-threatening alternatives, completely upending the argument that the Texas law in question was in place to protect the health and safety of women. Ginsburg went ahead and summed up her feelings on future abortion restriction cases with “So long as this Court adheres to [previous Supreme Court rulings on abortion access], Targeted Regulation of Abortion Providers laws like H.B. 2 that ‘do little or nothing for health, but rather strew impediments to abortion’… cannot survive judicial inspection.” So, to all the state legislators looking to pass TRAP laws, Notorious RBG has her eye on you, and if you're really lucky, she might teach you a few new French phrases.